I reviewed their debut album for ‘Maverick’ magazine and described Sedar Roses vocals as having the ‘almost languid drawl of Lucinda Williams, but with more range and expression’ and Davis’s as ‘like a Whiskeytown era Ryan Adams.’ Can’t really argue with either, although the latter is not quite so relevant to this current album. former plays acoustic guitar, mandolin and kazoogle whilst Davis plays acoustic and electric guitars, mandolin, banjo and harmonica. The album was recorded in Austin, Texas and was produced by the couple in conjunction with Britton Beisenherz, who also plays Electric bass, Rhodes and percussion.The other musiciansused on the album are not part of their touring band but are worth mentioning because of their quality and the fact that it shows the range of sounds covered on this album. They are Jeff Bryant on B2 organ, Rhodes and clavinet, Kyle Clayton, upright and electric bass and Clint Simmons plays drums and percussion. So there are plenty of variations used, but the sound is rarely too dense, even on a few tracks being quite sparse, another contributing factor to the contrasts and unusual feel of the recording. moody folksiness of Polka Dot Dress, some swampy guitar and Sedars vocals on the bluesy Right down to it and an old time hillbilly feel on Wrinkled Neck Mule with Aaron on lead vocals and banjo and also includes some atmospheric harmonica and kazoogle! 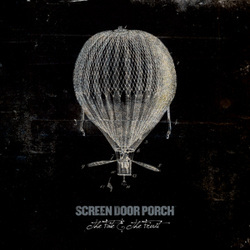 This is only their second recording as Screen Door Store and maintains the high standard set by their debut album. The only real reservation I have about them being a huge success is that they are impossible to pigeon hole or fit comfortably into any genre. A huge plus for the band and us music fans but a nightmare for promoters and A & R people!